Definition - What does Thunderbolt Pose mean? Thunderbolt pose is a seated pose that assists in gently stretching the legs, from thighs to knees to feet. To enter the pose, begin by kneeling on the floor. Lower the hips and buttocks to sit on top of the heels on an exhale. Sit up tall and activate the core muscles, arms relax on the tops of the thighs or along the sides of the body, with the palms down. Thunderbolt pose is also known as vajrasana in Sanskrit. Thunderbolt pose increases blood flow to the lower abdomen, which can aid in digestion and pelvic health. 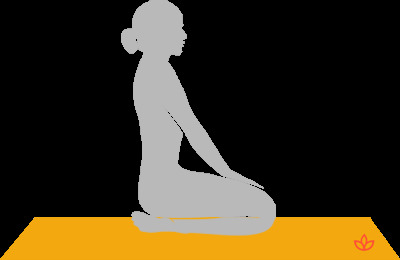 Although it is recommended that asanas are not practiced after eating a meal, this pose is suggested to aid those with poor digestion after mealtime. It also strengthens the muscles that support good posture — the back, neck and chest — and can provide helpful relief for individuals with lower back issues or sciatica. If pain is felt in the knees when practicing, the yogi should come out of the pose. Otherwise, sit and enjoy the pose as long as is comfortable, being mindful of the breath.